This section provides a tutorial example on how IE 10 renders Flash files specified in the 'src' attribute of an 'object' element. Test 1 shows that IE 10 is smart to use the file name extension to determine the content type and run the Flash Player ActiveX to render the flash file. But the flash file is rendered in a display area of predefine default size, because no "width" and "height" provided. Test 2 shows that IE 10 works correctly with "width" and "height" provided. "type" attribute is optional. Test 3 shows that IE 10 recognizes type="application/x-shockwave-flash" as Flash content type. IE 8 also resize the display area based on "width" and "height" attributes. 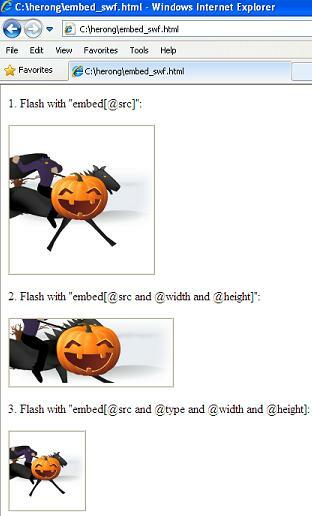 Comparing with Firefox 26, IE 10 behaves ok on rendering flash files provided in "embed" elements.